Do you think you might be Vancouver’s top Chinese chef? The 2011 HSBC Chinese Restaurant Awards is accepting applications from chefs who wish to participate in its Chinese Chef of the Year contest. Applicants will go through a rigorous screening process by a panel of judges headed by Founding Chair Stephen Wong and our 2010 & 2009 Judge Conrad Leung (also Head of Asian Culinary Department at Vancouver Community College). The successful eight finalists will compete in a modern Chinese cuisine challenge by preparing dishes in two of three categories – Wingtat Free Run Chicken, Geoduck and Tofu. Application deadline is November 22, 2010. Details and entry forms can be downloaded below. Submit completed Applications to Event Manager Rae Kung rae@chineserestaurantawards.com For more information, contact Rae at 778-829-6244. The competition is open to all professional chefs who currently cook in a Lower Mainland Chinese restaurant. a. Complete the Entry Form. b. Submit a separate Ingredient / Method Card for each entry. g. Be able to compete for 2 categories in a total of 50 min. The 3 winners will be invited to attend the HSBC Chinese Restaurant Awards 2011 Awards Ceremony on Tuesday, January 18, 2011. Proper Chefs uniform is required for winners during acceptance of awards. Result will be announced at the ceremony. To prepare and present, one main course; two dishes and each dish for 10 persons of a modern Chinese dish where the main item consists of Wingtat free run chicken and appropriate ingredients. · Contestant may present the dishes in any preferred format, which will enhance dishes and reflect the trend of modern Chinese cuisine. · The organizer will provide two Wingtat free run chickens (Courtesy of Wingtat Game Bird Packers); each chicken at approx. 2lb each. · Contestants are allowed to pre-marinate the Wingtat free run chicken before the competition. 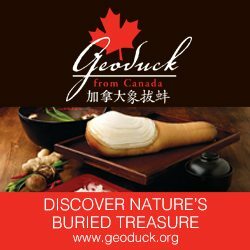 To prepare and present, one main course; two dishes and each dish for 10 persons of a modern Chinese dish where the main item consists of geoduck (courtesy of Underwater Harvesters’ Association) and appropriate ingredients. · The organizer will provide two geoducks (courtesy of Underwater Harvesters’ Association); each geoduck at approx. 2lb each. To prepare and present, one main course; two dishes and each dish for 10 persons of a modern Chinese dish where the main item consists of tofu and appropriate ingredients. · The organizer will provide Superior Tofu products(Courtesy of Superior Tofu). Please state which tofu products are required and the quantity at the Ingredient card with the Entry Form. Correct planning and arrangement of materials for organized execution and service. Correct utilization of working time to ensure punctual completion. Correct basic preparation of food corresponding to today’s modern culinary art. Preparation should be practical, acceptable methods that exclude unnecessary ingredients. Punctual delivery of each entry at the appointed time is required. Appropriate cooking techniques must be applied for all ingredients and vegetables. · Dishes will be assessed for their flavour / tastes, creativity / innovation, presentation / appearance as well as sanitation and hygiene. · All garnishes and carvings must be edible. · All sauces / marinates should be made at the venue on the day. · All cooking and preparation process should be executed in the kitchen. · All dishes must be prepared under the highest hygienic conditions. Artificial colouring or chemical additives (e.g. MSG, de-foaming fluid, emulsifiers, artificial flavours) are not allowed. · Contestant is required to place the recipe on the table for judges to check. · The organizer will prepare all ingredients, vegetables, and sauces as listed by each contestant in the entry form.